The Pacific Crest Trail is a 2,665 mile (or so) long hiking trail from Mexico to Canada, located in the states of California, Oregon, and Washington. If you would like more information on the PCT itself, check out the Pacific Crest Trail Association's homepage. Bring out the middle-manager in all of us with detailed hiking statistics! This program bases its calculations from trail data derived from the 2005 PCT Data book and Halfmile's PCT Trail Notes (for the resupply locations). Please note: I have done my best to fix all bugs and known errors with this program. The intent of this program is to provide a tool for estimating your hiking time and not a substitute for careful planning of a PCT hike. Although I've done my best to ensure that this program works correctly, I cannot guarantee that the distances/times this program gives you will be 100% accurate. * The idea here was that one day I'd get all my PCT photos of the trail scanned and they would show here. This was in 1999. Since then I biked around Australia, started humanclock.com and humancalendar.com, bought a house, and got married. Hence, other things have "gotten in the way." Rather than come up with a photostream from flickr or something, I've chosen to just leave the photo here since it has been here for 10+ years already and notions of history are now coming into play. 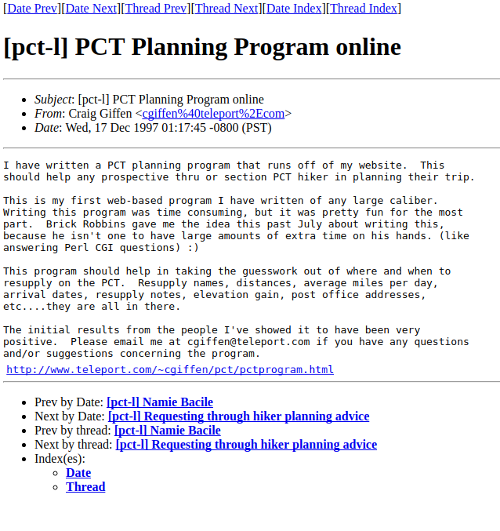 The PCT Planner turns 20 years old today! Next year it can go drinking, which if you were to look at the Perl code that I wrote back in 1997, you'd swear I was the one doing the drinking. Anyway, I have updates to make to it but have a different PCT project to finish up first over the next few months, so they are going to have to wait a bit longer. 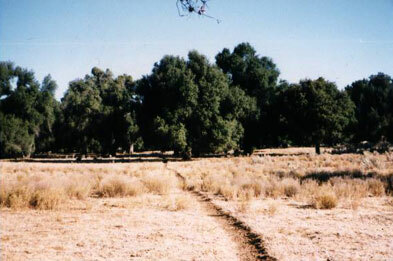 The above is a post I made to the PCT-L email list on December 17th, 1997. In the list archives, the URL isn't in the original post. So either it go cut off, or more likely, I made a big announcement about this great new thing and forgot to tell people were to find it. I added in the url from a post I made a few days later. The backstory about how this whole thing came to be is on the about page. Going forward, I'm working on a new version of the planner with some much needed features (put the addresses back in, work on mobile phones). I have another PCT project in the works though ahead of it that I'm trying to get done in the next few months, so the planner update will have to wait a bit longer. (Well, and I had issues with our kitchen, so I tore it down to the studs and have been rebuiliding it over the last few months). Anyway, thanks for all the feedback and you can contact me at humanclock@gmail.com if you have any questions or there are features you want the program to have. After October 1st, 2015, Echo Lake will no longer have a post office. "If addressed to us the package will be held at Twin Bridges P.O. (9 miles west on Highway 50). Alternatively, hikers can mail to the SLT main P.O: 1046 Al Tahoe Blvd, South Lake Tahoe, CA 96150 (about 10 miles from Echo Lake)." Although the town of Acton was already on the PCT Planner and at the same exit point, I added the Acton KOA as a resupply option. There is also another resupply option availble at Sonora Pass that is working under a special use permit with the Forest Service, Sonora Pass Resupply. Just a heads up, Hiker Heaven in Agua Dulce is now closed. I have changed the planner to reflect this but didn't remove the option as to not break existing hiking plans. I spent short of a long while writing up a bunch of advice and tips for hiking the Pacific Crest Trail. I am on the PCT this year, you can follow my travels on lunky.com and on Twitter. I've added Hart's Pass as a resupply/start/end point. That is all. Oh, there is also a 95% chance I'll be on the PCT myself in a month. Ok, version 5.0 is online! This was in beta for a couple months so any issues should be resolved by this point. Please contact me if you find anything wrong or can't figure something out. This planning program now uses data from the 2005 edition of the PCT Data Book. The Data Book derives its data points from the 2003 edition of the California PCT Guidebook and the 2000 edition of the Oregon/Washington PCT guidebook. Because of the trail data change, the trail distances have changed slightly. You can see details of the changes on the discrepancy detail page. 71 new places to start/stop/resupply have been added. Some of these are redundant in that they are at the same exit point on the PCT. This was only done for asthetic reasons to make your plan more accurately reflect where you are resupplying. I used Halfmile's PCT Trail Notes to help determine which resupply points would be most essential to have added to the program. New maps and graphs. After 14 years I bid goodbye to the PCT graph generator script I wrote in 1998. Since it is 2012 there are a lot more freely available graphing packages available now. There are still a few kinks to work out so the appearance of the graphs might change from time to time. Each trail segment now shows the appropriate PCT guidebook sections. I added an option to make the graphs "full scale" (0-14,000ft) or "Auto scale" (determined automatically). This is accessed by click thing the "+Display Options" via the adjust page. Added an opt-in "Live Map". This essentially shows where each PCT hiker is at (approximately) on the PCT based on their active hiking plan. The map updates every few hours. You can now select one of your hiking plans to serve as your "active plan". When you select this, your trail name (nickname) will show up on the map along with an optional link to your blog/website. For obvious privacy reasons this is opt in only. Only one plan is allowed to serve as your "active plan". You can configure your trail name and web url on the account settings page. Added the ability to expand/collapse a given section on the adjust page. Collapsing a section will allow you to ignore portions of the plan that you have already done, etc. Added an option to update your most recent resupply arrivial point and date. Updating this will ONLY alter your arrival/departure dates for future resupplies. Thanks to user Brett Fisher for pointing out a slight program bug. It was "slight" in that it was hard to reproduce and only affected the time between your arrival and departure at a resupply layover. Basically, when you would select the "always take the rest of the day off" option at a resupply, sometimes it wasn't adding in enough layover hours to place your departure date at the next day. You should still doublecheck your plan to make sure nothing significantly changed. I cleaned up some of the layout where things were not centering/lining up like they should. I finally got around to adding a "Donate" button. This site doesn't burn up any bandwidth like the humanclock.com and humancalendar.com websites do, but it does take some time. If you want to buy me a virtual beer/coffee then that is always nice though. I made a change so the distance to the resupply will always be in the standard unit system. Since some of the resupply points are combinations of walking and hitchhiking, it is a little more involved process to try and have the distances convert if you are using the metric system. I will get this changed in the future. I fixed a bug that would only show up when using the metric system in certain cases. If you are using the metric system please doublecheck your plan, the calculated days between resupplies might differ slightly. Thanks to Robert in Austria for pointing this out! I added the specfic "trail" and "town" layover days to the plan summary page. Thanks to Erin for the suggestion. I also added a view option to dump all of the overview map sections onto a single page. Version 4.0 is online! This is a nearly-complete rewrite of the program. PLEASE let me know if you find any problems. "98% Complete" rewrite! Bugfixes, UI overhaul, and many other changes. A new decade: a new background color. (the 90's was green, 00's were dark blue, lighter blue for the 10's). Can clone and delete plans. Overview maps and graphs that change with your start points. If the arrival date lands on a US Federal Holiday (2011,2012), Saturday, or Sunday; the day name is highlighted in red indicating the post office/town might have more limited access. You can now specify separate layover days "on-trail" vs. "in-town" layover days. Option to automatically take the rest of the day off at a resupply point. Graphs available in metric format. (change this in account settings). The trail plot on the graphs are no longer black, but a more realistic brown. Separate "notes" field added to each section so you can write notes on a section/resupply specific level. When creating a new plan, the more popular resupply points are checked by default. Note: I have removed the specific details (addresses, ammenities, etc.) about each resupply section. I have been somewhat out of the loop from the interworkings of the PCT, so I'd rather leave these sorts of details to other people. It isn't 1997 anymore and THE INTERNET is a bigger place now, so there are more up-to-date resources out there for this sort of thing such as postholer.com and Yogi's Guides. Due to new password restrictions, the old passwords will no longer work. Click the "forgot password" button to get a new password. If that doesn't work please contact me. All existing plans have been converted to work with the new system. The only known issue is that resupply arrival dates for some plans created in 2000-2006 might have drifted by a day. This was due to an issue of the code running on different servers over the years and the timezone offsets changing. (this issue has been corrected in the 4.0 version). In the previous version, any "Extra Days" you added to a section are now "Extra On-trail Days". IMPORTANT! I changed the password system/requirements so your existing password will not work. Please click on the "forgot password" button to have a new password sent to your email address. Sorry for the inconvenience. If you didn't have an email address (or had an old one) associated with your account, please write me and I'll help you out. Version 3.1 is online. I added the cross section graphs back into the program after a six year hiatus. These graphs are part of the new (unreleased) v4.0 version of the program but I backported them to this version. Also, the "per day" calculations no longer factor in extra layover days. This was a common request/complaint so I changed it. PLEASE let me know if you find any problems. I updated the resupply towns to indicate that Ollalie Lake is no longer a resupply option. I left it in the program however, but changed the text accordingly. Thanks to Sheila Pearson for sending in a long list of changes to the post office/town information page. I am back in Portland, Oregon now. New PCT planner site will be up after I finish the new humanclock.com website. When that will be exactly, eh, how about we change the subject. :) I had to pull the graphs from the system because my ISP changed a few things around and they quit working correctly, they will be back in at some point. Yup, I'm still in Australia. You can follow me biking around Australia. Oh dear, such neglect. I'm trying to get the site revised but it is going slow. Most of my time has been spent on the clock picture website. (check it out, a photo for every minute of the day!) I'm going to Australia in a week and hope to update this site via my laptop. I've made a bunch of changes and linked up this version to the outside world. There are still a few bugs floating around. The old version of this program is still online [edit: no longer as of 2009]. Please contact me if you have problems or have questions. New version (3.0) is finally online at its own domain of pctplanner.com! This program is a much needed rewrite to the PCT planning program I wrote in 1997. New features are added, most importantly, user accounts with the ability to save your plan. I have been working on this new version on and off for the past two years and am happy to finally have it done. A big thank you goes out to everyone who has given me feedback over the past few years and my friends for putting up with my whining / anti-social behavior while I worked on this program. Eh, ignore that last news item stating the new version of the planning program would be online around July 1999. $21.8 million buyout offer turned down (kidding). New version should be online in a month or so. Made a couple code changes for the graphs and moved the site to a new ISP. Updated the layout of the pages, enjoy. I added maps from street atlas USA to the post office section. Site is now at newestindustry.com. Version 2.0 is online. The primary feature is that there are now cross-section graphs generated for each trail segment of your hike. I added an option to hike at a slower pace the first few days of your hike. Sonora Pass added as a resupply option.